Television makeup artist Laura Geller has been creating makeup magic on celebrities since the 1980s and she launched her namesake cosmetics line, Laura Geller Makeup, over 10 years ago. The extensive makeup range includes everything you need to create a flawless face including foundation, powder, eye shadow, blush, lip products and kits. The cosmetics line is primarily sold at QVC, but is also available at beauty retailer Ulta and on the Laura Geller website. In addition to the Baked collection, Laura Geller has a slew of products for face, eyes and lips, as well as prep products like primers. Wrinkle Paver Pen Line Smoother is a line filling primer that diffuses the look of fine lines and wrinkles. Welcome Matte Skin Enhancer is a gel-based primer that absorbs oily shine. Spackle Under Makeup Primer retexturizes skin and contains natural plant extracts and antioxidants. 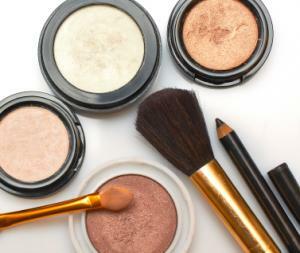 Powdered Silk Mineral Powder is a pressed mineral powder that gives skin a polished finish. Phenomenol Foundation is a silicone-based liquid that gives a sheer, dewy look. Barely There Tinted Moisturizer is a foundation, sunscreen and antioxidant-rich moisturizer in one that helps reduce the appearance of fine lines. Hide n Shine Concealer and Highlighter is a duo compact that features concealer to hide imperfections and highlighter to brighten the face. Caulk Concealer is a pencil concealer with vitamin E and reflective pigments. Banish n Brighten is a concealer and luminizer in one to diffuse dark circles and blemishes. Real Deal Concealer is a heavily pigmented concealer that covers all types of flaws from scars to tattoos. Creaseless Concealer brightens and conceals under eye circles. Hint Tint Cheek Color is a water-based cheek stain that gives a natural flush. Cheek Sweeps is a portable creamy blush that you can sweep on without using a brush to blend. Eye Stay Lasting Eye Color is dual-ended tube containing two creaseless cream eye shadows. Wonder Wand Eye Brightener Powder is a universally-flattering shimmer pearl pink shade that brightens the eye area. Double Eye Appeal is a dual-ended stick that contains a highlighter on one end and clarifying color on the other. Color Confections Eye Shadow are pigment-rich shadows that layer matte and pearl pigments. Creamy Black Mascara conditions and thickens for a natural lash look. Mighty Mascara and Fortifier is a dual-ended mascara that contains a fortifier to condition and strengthen, while the mascara side deepens the color of lashes. Full Figured Lashes is a creamy volumizing mascara that contains rice protein and vitamins to thicken and strengthen lashes. Lash Varnish and Comb is a blue-tinted gloss that makes lashes look shiny and the whites of eye brighter. Lipstick is moisturizing and lip plumping and comes in 10 shades. Crème Couture Lipstick is a full coverage lipstick with a soft matte finish and comes in five shades. Dream Creams Lip Palette is a four color compact with a brush and shades that can be mixed and matched. Lip Stay Long Lasting Color and Gloss is a long-lasting lipstick and gloss duo for hours of wear and comes in five shades. Lip Shiners is a high shine lip gloss with vitamins A and E and comes in five shades. Color Confections Lip Gloss is a lip gloss pot that's non-sticky and provides luminous color in three shades. Lip Parfaits are swirled lip gloss tubes that offer shine and taste and come in nine shades. Lipliner comes in two shades and won't feather or fade. If you live in the New York area and are interested in a makeup session with Laura Geller herself, or one of her veteran makeup artists, the makeup artist has a studio on the Upper East Side where she will make up your face using her own products. Laura Geller specializes in wedding makeup, but she can paint your face to perfection for nearly any occasion. The address is 1044 Lexington Avenue, New York, NY 10021. Hours are Monday through Saturday 10am to 6:30pm. The next time you're looking for high quality, luxurious cosmetics, or the celebrity treatment with a makeup application, look to the Laura Geller Studio to sample her signature products.